Hi all! Guess what- there's a new digi release happening today over at Tiddly Inks! 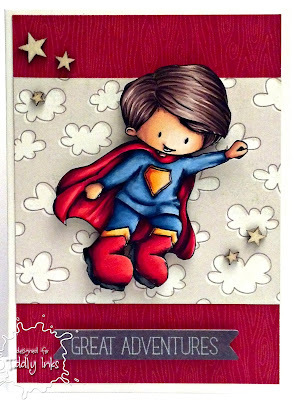 If you like boy images then you must pop on over because Christy has come up with some of the cutest images ever- the DT has been having a blast playing around with them so I'm sure you'll love them too :) Now I had a blast coloring up this little Super Boy here and he would be perfect for so many different kinds of cards. I went the clean and simple route because that seems to be the only way I know how to do a boy card, lol! I hope you like it and please stop on by the TI blog to see what the rest of the DT have done with all these new images- there's a ton of eye candy :) Thanks for stopping by to visit me!! 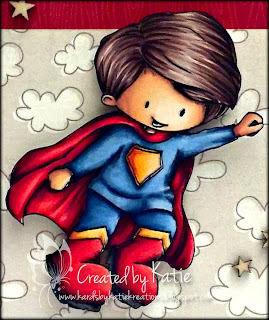 This little Superman is so totally CUTE!! Love how you colored him! !